From left: Laura Jenkins, Ko Zushi and James Gordon Miller in the Ghost Players Theatre Company’s production of “Tape,” now playing through Feb. 17 at the Sherry Theater in North Hollywood. 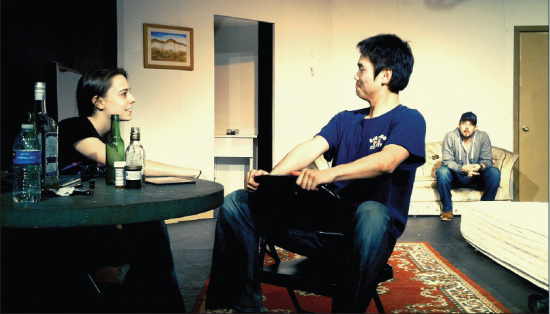 NORTH HOLLYWOOD — For Kohtaroh Zushi, the latest production for his Ghost Players Theatre Company holds a place of particular prominence. The theater group founded by Zushi and his wife, Stephanie, are currently staging their second production of Stephen Belber’s “Tape,” the three-character play that was adapted into a 2001 Richard Linklater film starring Ethan Hawke, Uma Thurman and Robert Sean Leonard. Zushi, who stars in the current production with Laura Jenkins and James Gordon Miller, explained how “Tape” was the first production his company brought to the stage in 2009, and he wanted the opportunity to revive it with some fresh talent. “I’m the only one from our original cast, but this production is better because I think we’ve been able to refine our approach to it since the first time,” he said. “Tape” finds three former friends who have reunited in a seedy motel room after 10 years apart, with the goal of playing out some of the unresolved drama of their final days in high school. As years of denial slowly peel away, each is provoked into revealing their true nature. Performances of “Tape” by the Ghost Players are Fridays and Saturdays at 8 p.m. and Sundays at 3 p.m. through Feb. 17 at the Sherry Theater, 11052 Magnolia Blvd. in North Hollywood. Tickets are $20 at the box office or in advance at www.theGhostPlayers.net. Call (310) 210-9143 for more information.